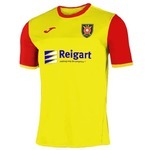 Hi: New Follower | Albion Rovers F.C. Hi I’m a new follower to Albion Rovers I’ve often followed Scottish football and have developed a soft spot for your club, I’m actually a born and bred Crystal Palace fan all my life from originally London and now live in Norfolk, I will be following your results and hope you can improve on your present position, good luck to you all and have a great 2019. Splendid;hope you make it up to Coatbridge for a match. Crystal Palace has always been my favourite English team...I think its the name (and the nickname "The Eagles"), the colour of the strip and that they have mostly been underdogs amongst the London teams.... oh and I like Roy Hodgson too! Welcome to the ARFC community, colsy. Sadly, I've never been to Selhurst but if I ever do get the chance, I'll go to a home game. Best wishes to you and to Palace for 2019. Welcome to the message board Colsy! It’s traditional for new members to be referred to as “David Caldwell” or “DC” for short, just play along. In all seriousness welcome to the club! What got you interested in Rovers? It’s only recently I started to follow Rovers fortunes many years ago I had a pen pal who supported Queen of the South so I followed them for awhile, hopefully I will be a good luck charm to your club and see your club climb the table which I’m sure you will. If you want to find out how you can support in a practical sense, why not have a look at www.albionrovers.info - the new and developing site which offers a choice of ways in which you can back Albion Rovers.